Pickup Some Creativity: ::Birthday Surprises:: Shabby Apple Giveaway! 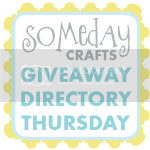 ::Birthday Surprises:: Shabby Apple Giveaway! My husband and I both celebrate our birthdays this week. As it's close to the anniversary of my blog, as well, I thought some giveaways were in order. Shabby Apple has graciously offered to give another beautiful dress to a reader! Click on over to my review blog HERE for a chance to win the beautiful Lighthouse Dress! Please note, no comments on this post will be entered, you must comment on the review post HERE. Happy Happy Birthday!! I am so grateful we have become friends. I love learning from you. I hope your birthday week is a great one. Happy Birthday!! so many people I know share a June / July birthdays! I am hosting a blog party every Wednesday for people to promote their business, etsy shop, etc...I'd love for you to join! Also if you have a giveaway or know of one..by all means, link it up!